This package contains two articles reporting odd sidelights to preparations for the first Indianapolis 500. One example has Bob Burman driving on the Long Island Motor Parkway in New York at speeds exceeding 80 mph - at midnight! He was testing a new Remy electric product, a headlight. 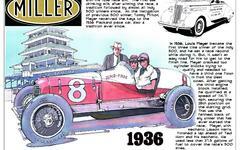 Also, Ralph Mulford is reported to have driven from Detroit to Indianapolis in his Lozier race car. His wife Dolly rode in the riding mechanic's seat. These articles were published May 20, 1911. Mrs. Mulford was an accomplished mechanic and frequently rode as his riding mechanic during practice runs for races, but was restricted from participating in competitive events due to AAA regulations.